Random Art: Lost Weekend Or Future Gold Mine? It’s Your Move, Hollywood | "DESTROY ALL FANBOYS!" A few years back I was sitting in a diner listening to some folks at a nearby table debating some recent Hollywood remakes that were terrible (what else is new?) because they were basically updated version of the original films with more modern jokes. One of the guys at that table made the point that it would be better to remake a film that kept the title for familiarity but yanked the concept into new territory. 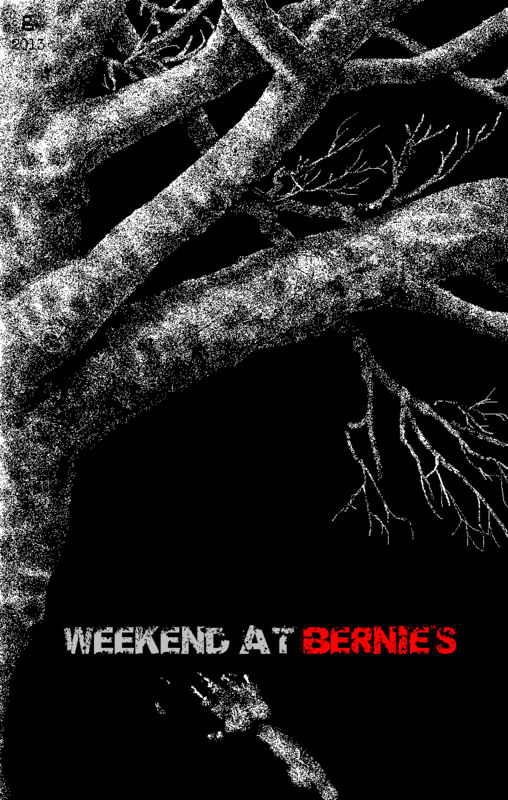 A light bulb went off in my nosy little head and later at home I whipped up a poster idea for an old film I hated, Weekend at Bernie’s, re-imagining it as a dead serious zombie film of some sort with some of the same cast just to mess with the minds of those who recall it as a comedy. For some reason, this idea keeps popping in and out of my head every few months or so. Recently, thanks to more remakes that don’t need to be made at all getting some funky not so fresh trailers (like this one. Seriously? WHY?) But I’m not about to suggest any budding to veteran screenwriter tackle this for real. Well, unless you’re willing to deal with those who somehow hold this stinker “sacred” lining up at your doorstep (or on some message boards) to take you to task for desecrating their nostalgic memories of this flick. Anyway, that first piece above is my latest revision of the idea, the one below that has a font I like better, the third is an old piece I just added some lettering to and this link goes to my horrible-looking original poster concept. I even worked up a plot outline at that time, but it didn’t have much of an ending. Or a middle for that matter. Hey, I just come up with ideas, ladies and germs. Someone toss me a sack of money and yeah, I’ll come up with the rest of that movie in a heartbeat. Inspiration comes from the strangest of places. Like a sudden sack of money, for example. This entry was posted in 2015, Commentary, DAF, Humor, Movie Posters, Updates and tagged 1989, 20th Century Fox, deviantArt, Ideas, Illustration, Movies, MS Paint, Nostalgia, Random Art, Remakes, Weekend at Bernie's, Yeah I Did That by geelw. Bookmark the permalink.